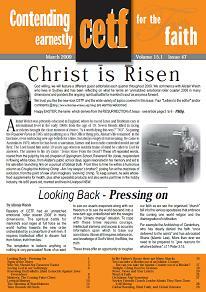 God willing, we will feature a different guest editorialist each quarter throughout 2009. We commence with Alistair Welch who lives in Sydney and has been reflecting on what he terms an ‘unmatched emotional roller coaster 2008 in many dimensions’ and ponders the ongoing ‘spiritual battle for mankind’s soul’ as we press forward. We trust you like the new-look CETF and the wide variety of topics covered in this issue. Your "Letters to the editor" and/or comments@ are warmly welcomed.